Tashkent – 2200 anniversary. Tashkent is a city of magnificent beauty, sunny and welcoming, the city of harmony of ancient architecture and modern urban planning. Tashkent has such epithets as “The City of Friendship”, “The City of Peace”, The City of Bread”. In 2007 it gained a new one – “The Capital of Islamic Culture”. In 2009, by The Decree of UNESCO Tashkent celebrated its 2200-year anniversary. It is an important event, not only for Uzbekistan but for the whole world. During the years of Independence much attention was given to renaissance of national values and preservation of architectural monuments. Tashkent has made a huge contribution to development of world civilization. City of Tashkent has the highest in the republic economic and scientific-cultural potential.Tashkent is a political and economic center of the Republic of Uzbekistan. The Residence of the President of the Republic of Uzbekistan, the Legislative Chamber of Oliy Majlis, the Senate of Oliy Majlis, Cabinet of Ministers, foreign embassies, public organizations, as well as the main control of all ministries and departments of the Republic of Uzbekistan are located here. Tashkent is the capital and the largest city of the Republic of Uzbekistan which has a central location in Central Asia. The territory of the Republic – 447.5 km2. The population is about 25 millions of people. 10% of the whole population live in the capital – 2.5 millions. Here there are more than 100 nations and peoples of the world. Tashkent is situated in the branch of Western Tien Shan, at a height of 420-280 meters above sea level. The city is situated in the same latitude with Madrid, New-York and Beijing. The city lies in the middle course of the Chirchiq river valley, in a flat-hilled terrain and covers the territory of 320 km2. The average climate in Uzbekistan is sharply continental with a short winter and a long hot summer. 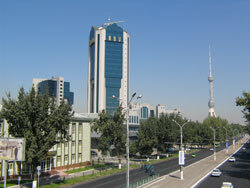 But the climate in Tashkent is milder due to its neighborhood to the mountains and a large number of canals and greens. The summer temperature is about +40 degrees, the winter temperature is about 0 degrees. March is the rainiest month of the year. The resident population of Tashkent on 1 January 2008 amounted to 2.18 million people. Of these, 76% Uzbeks, 15% Russian, 5% Tatars, Kazakhs 1.6% and 2,4% other nationalities. Over one third of residents (33.5%) - less than 15 years, 61,7% - at the age of 15 to 64 years and 4,8% - from 65 years and older. Average age - 22.36 years. Middle life expectancy - 64.19 years. Experts note that even with the existing rates of natural increase by 2020 the population of Uzbekistan may reach 40 million people. Official language - Uzbek. Over the 2200 years history of its existence, the city survived both ups and downs, but always remained at the crossroads of international trade, and was a center of culture and art. Many histoical monuments were preserved and restored such as mosques, mausoleums (one of the best - Mausoleum of Yunus Khan), madrassahs - Barak-Khan and Abdul Kasim-Eshon (XVI cent. ), Scenic Jami Mosque (XVIc), Mirza-Yusuf (XIXc) and Hayrabat-Eshon (XVIII-XIXc). 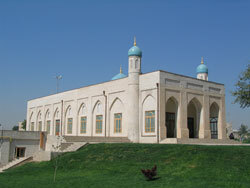 Functioning Kukeldash madrasah (XV c.) was recently renovated. There are also Orthodox churches, nunnery, Polish church and some other temples. The exact time of founding of the city is unknown. For the first time, the area coinciding with the area of Tashkent is mentioned in the Chinese primary sources of II century BC under the name of Yuini. In the later sources the same area was called Zheshi, Chach, Shash or Shi. The sign corresponding to the last sound combination is used in the meaning of “stone” that often compares with a Turkic name tash «stone» + kend «settlement».